Murphy launched their U198H this year, and measuring only 10 1/2 x 7 x 6 inches it was extremely compact. 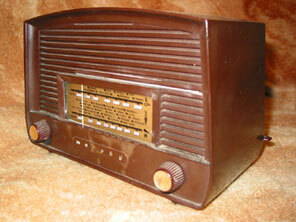 It was a very successful set, and the basic design remained a part of the range for several years. In having just the volume and tuning controls at the front of the set the cabinet was geometrically pleasing but created a problem for waveband switching. The picture above right shows Murphy’s solution, in the form of a switch at the rear of the chassis fitted with a lever that protruded out from the right hand side. The problem was that this lever is about 2 inches long and made of bakelite, and hence was highly susceptible to breakage or loss, hence very often examples of this set turn up with lever missing and an ordinary knob in place at the cabinet rear. Of course this means the waveband cannot easily be selected from the front of the set. 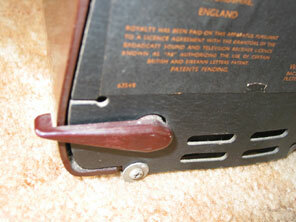 The set also suffered from heat build up, as discussed on the U198M example on the 1956 Murphy page, where an you can also view an internal chassis picture of the receiver. (In 1956 the front was sprayed white and the set was designated U198M). Valve line-up for the U198H is UCH42, 10F9, 10LD3, UL41, UY41.